When a global superstar schedules a concert in Israel (think Carlos Santana, Ms. Lauryn Hill), or when Israel hosts an international film festival (as it is this month), we protest. Because Israel uses culture as bleach, spending government funds in an attempt to scrub out the voices of Palestinians demanding basic freedom, dignity, and equality. 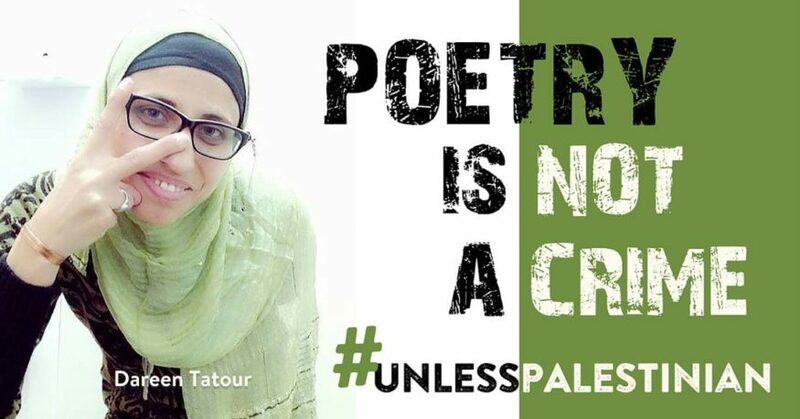 In no way is Israel’s cultural repression more clear than the current case of Palestinian poet Dareen Tatour. The Israeli army arrested Dareen on October 11th, 2015. For 8 months and counting, she has been detained and is under ongoing house arrest. The evidence against her? A poem posted on Youtube, and her reading of another poem at a Women’s Day commemoration in Nazareth. When we protest Israeli-government-sponsored art, Israel claims we are shutting down cultural exchange. But what culture is worth exchanging when Israel imprisons Palestinian poets for their poetry? Dareen has a powerful poetic voice, and Israel is punishing her for it. And now the Israeli government is going to hear from us. The JVP Artists and Cultural Workers’ Council has been mobilizing with partner organization Adalah NY in solidarity with Tatour. We started with a letter that thousands of writers, poets, and artists have signed. The demand is simple: release Tatour and drop all charges. Luminaries taking a stand include 10 pulitzer winners, including Alice Walker, Claudia Rankine, Ayelet Waldman, Noam Chomsky, Naomi Klein, Dave Eggers, and many more. Prominent media outlets have covered Tatour’s case, including Ha’aretz, +972, PEN, Al Jazeera, Poetry Foundation. In October 2015, police entered Dareen Tatour’s house without a search or arrest warrant. After several weeks in prison, the Israeli court indicted her under “Incitement to Violence” and “Support for a Terrorist Organization.” After 3 months of transferring her between Israeli prisons, they placed Dareen under house arrest in a rented home without internet access, miles away from her hometown near Nazareth. But after our sign-on letter, the Israeli military cited ‘international pressure’ when they finally allowed Dareen to live in her own home. She is slated to remain under house arrest for the duration of her trial. Her next court date is scheduled for September 6, and we will be standing with her. Dareen’s case, along with dozens more like it in recent months, illustrates the necessity of heeding the call from Palestinian civil society for an international Cultural Boycott of Israeli institutions and state-sponsored artists until Israel ceases its repression of Palestinians. As we support Dareen, we are growing the movement to ensure all artists have their right to free expression.